1. a solid figure or body having a circular base and tapering to a point. 2. one of the conelike structures which, with the rods, form the light-sensitive elements of the retina; the cones make possible the perception of color. See also eye and vision. Called also retinal cone. 3. in radiology, a conical or open-ended cylindrical structure formerly used as an aid in centering the radiation beam and as a guide to source-to-film distance. Cones were commonly attached to the x-ray tube prior to the use of the collimator. 4. in root canal therapy, a solid substance with a tapered form, usually made of gutta-percha or silver, fashioned to conform to the shape of a root canal. ether cone a cone-shaped device used over the face in administration of ether for anesthesia. gutta-percha cone in root canal therapy, a plastic radiopaque cone made from gutta-percha and other ingredients, available in standard sizes according to the dimensions of root canal reamers and files; used to fill and seal the canal along with sealer cements. Called also gutta-percha point. cone of light the triangular reflection of light seen on the tympanic membrane. pressure cone the area of compression exerted by a mass in the brain, as in transtentorial herniation. retinal cone cone (def. 2). 1. A surface joining a circle to a point above the plane containing the circle. 3. Metallic cylinder or truncated cone, either circular or square in cross-section, used to confine a beam of x-rays. 3. in radiology, a conical or open-ended cylindrical structure used as an aid in centering the radiation beam and as a guide to source-to-film distance. retinal cone one of the specialized conical or flask-shaped outer segments of the visual cells, which, with the retinal rods, form the light-sensitive elements of the retina. twin cones retinal cone cells in which two cells are blended. Physiology One of the photoreceptors in the retina of the eye that is responsible for daylight and color vision. These photoreceptors are most densely concentrated in the fovea centralis, creating the area of greatest visual acuity. 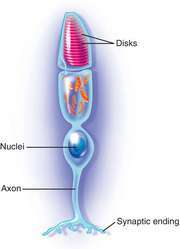 Also called cone cell. 1 a photoreceptor cell in the retina of the eye that enables a person to visualize colors. There are three kinds of retinal cones, one each for the colors blue, green, and red; other colors are seen by stimulation of more than one type of cone. 2 a cone-shaped device attached to radiological equipment to focus x-rays on a small target of tissue. See also cone biopsy. conic [kon′ik] , conical, adj. 1. A color receptor cell in the retina of the eye. 2. Growth cone, see there Urogynecology See Vaginal cone. 2. The photosensitive, outward-directed, conical process of a cone cell essential for sharp vision and color vision; cones are the only photoreceptor in the fovea centralis and become interspersed with increasing numbers of rods toward the periphery of the retina. (in plants) a reproductive structure in the form of a conical mass of scale-like sporophylls surrounding a central axis, found particularly in GYMNOSPERMS but also in other plant groups, e.g. horsetails (Equisetales). (in animals) a light-sensitive structure in the vertebrate eye. See CONE CELL. 2. Metallic cylinder or truncated cone used to confine a beam of x-rays. n 1. a geometric shape with a circular base tapering evenly to an apex. 2. a solid substance, usually guttapercha or silver, having a tapered form similar in length and diameter to a root canal; used to fill the space once occupied by the pulp in the root of the tooth. 3. an accessory device on a dental radiograph machine, designed to indicate the direction of the central axis of its radiographic beam and to serve as a guide in establishing a desired source-to-film distance. n the distance between the focal spot and the outer end of the cone; usually expressed in inches or centimeters. Modern dental roentgen-ray units usually have cone distances of from 5 to 20 inches (12.5 to 50 cm). n a tubular “cone” designed to establish an extended anode-to-skin distance, usually within a range of from 12 to 20 inches (30 to 50 cm). n a tapered or straight cylindrical stone that is used primarily to sharpen the curvature of dental instruments. See also stone, Arkansas and stone, Carborundum. n a conical or tubular “cone” having as one of its functions the establishment of an anode-to-skin distance of up to 9 inches (22.5 cm). 1. a solid figure or body having a circular base and tapering to a point, especially one of the conelike structures of the retina, which, with the retinal rods, form the light-sensitive elements of the retina. The cones make possible the perception of color. 2. in radiology, a conical or open-ended cylindrical structure used as an aid in producing high detail x-rays. the commonest, if not the sole, photoreceptors in the central area of the retina, where the function of acute vision is located. See also cone (1) above. in radiology, to restrict the x-ray beam. See also collimation. progressive dysplasia of retinal cones in Alaskan malamute dogs; causes impaired day vision from an early age. The rods are normal. a cone-shaped device used over the face in administration of ether for anesthesia. the triangular reflection of light seen on the tympanic membrane. the area of compression exerted by a mass in the brain, as in transtentorial herniation.